Hyperbaric oxygen therapy, used in conjunction with other therapies, enables equine practitioners to more effectively treat a wide variety of serious conditions in horses, particularly those pathologic conditions characterized by soft tissue swelling, bacterial infection, tissue necrosis, or poor blood supply. Hyperbaric oxygen improves the physiologic state of injured or underperfused tissues (those that aren't receiving enough blood) by providing increased oxygen levels. Additionally, hyperbaric oxygen increases the production of beneficial growth factors and mobilizes and activates stem cells. All of these effects are helpful to repair damaged tissues and heal injuries in horses. In all our reading about HBOT for human sports injury, we've found nothing so clear and simple. Elite farriers (not to be confused with blacksmiths) often refer to themselves as equine podiatrists—an expanded mandate that covers corrective shoeing, which can improve the way a horse steps and moves. They tackle the cliché of the horse business: “No foot, no horse." 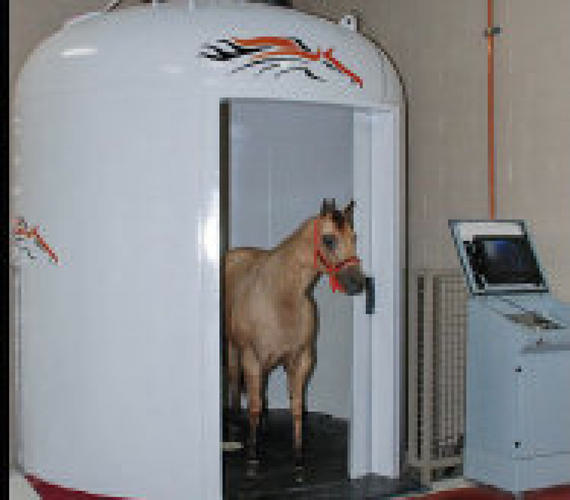 As in human sports, horseracing authorities struggle with training and rehabilitation regimens, like HBOT, that may enhance performance and create unfair competitive advantages. Someday, when we're feeling confident we've got HBOT for people totally covered, we'll go talk to some vets. Just watch we don't blow all our money at the track.